Today’s post is a double “P”—Peace Pilgrim. We desperately need this vision—and people who will dare to exemplify it—now more than ever. At this very divisive time in our national history, let’s take a moment to remember that we do. For me, it is impossible to talk about “the One” without also considering “the Many.” Seekers in all cultures and times have pondered at various levels this mystery of manifestation and source. The first time I heard of this philosophical problem—this human quandary framed in abstract terms—a lot of my personal searchings started to fall into place and make more sense. We struggle in trying to say anything about the world, and always we stumble over this paradox: How can everything that is be related back to a single substance, entity or idea? In a universe of seemingly endless variety and perpetual change, the dilemma of “The One and the Many” underlies all. The earliest Greek philosophers often concerned themselves with this puzzle. And the problem of the One and the Many still dominates Western concepts of the universe, including modern physics. Will science ever validate a theory that will unify (“make into one thing”) the laws of physics? These bloggish reflections on key words, working through the alphabet, give me an opportunity to “live the questions” aloud, so to speak. Especially since there is not much chance we’ll be among them! I like philosophy the way some people like politics, or football games, or unidentified flying objects. —John Gardner. Every single creature is full of God and is a book about God. —Meister Eckhart. By the act of observation and intention, we have the ability to extend a kind of super-radiance to the world. —Lynne McTaggert. A bit beyond perception’s reach I sometimes believe I see that Life is two locked boxes, each containing the other’s key. —Piet Hein. Narrative: a collection of events that tells a story, which may be true or not, placed in a particular order and recounted through either telling or writing. Narrative is the way that we convey our stories to each other, exercising our “voice” and lending it, sometimes, to a variety of other persons’ perspectives as well. It is our weaving of the human drama into a pattern that “tells” about life. But Narrative also tells us a lot about ourselves and our lives as we are living them. When we are able to connect the events of our human experiences into a coherent shape, we are more likely to see purpose and meaning in the little things that happen to us—and remember times when just such small incidents ended up being clues to our destiny. It is for some of these reasons that I chose to write in Narrative, specifically in excerpts of condensed dialogue between a mother and daughter, in my books Becoming Flame and Spinning Straw, Weaving Gold. 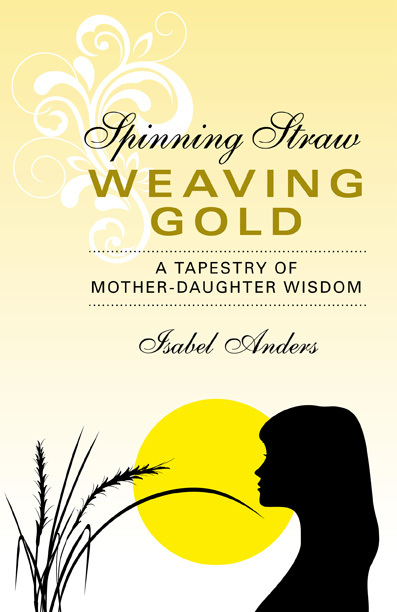 I see something spiritual in the Narrative quest as well, and so I use this conversational form, drawing from my experience as a woman and a mother—seeking to convey some essentials of feminine collective insight, as wisdom is sometimes “kneaded” and made into “bread” right within our own daily exchanges. Such dialogues can be seen as cameo stories with imagined details that extend beyond the borders of the words spoken. As an instance of Narrative, they invite the imagination to enter in, filling in richness from memory and the mind’s eye. In fact, all stories, even the most descriptive, require this of the reader. Since much of the Bible itself is presented in Narrative form, I find it natural to think both in terms of specific setting and acts, and also more timeless implications.